Cedar Log & Lumber carries a wide range of stains, finishes, coatings and wood treatments from Gemini®, Perma-Chink® and Sashco®. Don't let nature and the elements ruin the fine quality and craftsmanship of your next project. 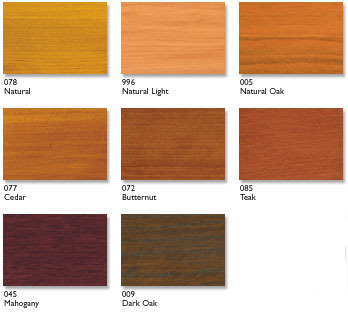 Protect the natural beauty of our wood products with proper coats of stain or finish. Cetol BL Interior Clear is a urethane-fortified acrylic formulation designed to offer a high-performance clear finish in satin for most interior wood surfaces. Cetol BL Interior Clear offers protection, durability, and easy application for both the do-it-your-selfer and the professional contractor alike. Description: Waterborne translucent finish for interior woodwork. Description: Waterborne translucent finish for interior woodwork made for light-colored woods or when a matte finish is desired. Cetol 1 is a premium, translucent exterior wood basecoat to be used with Cetol 23 Plus. Its superior alkyd formulation offers excellent penetration and adhesion to vertical wood surfaces. Description: Premium translucent exterior wood basecoat to be used with Cetol 23 Plus. Can also be used alone or with other products. Cetol 23 Plus is a premium, translucent topcoat for Cetol 1. The advanced alkyd resin with UV absorbers offers excellent durability and protection for siding and other vertical surfaces.